Few of you Fellow Travelers may be aware, but Comrade Cortez’s Green New Deal was predicted over a century ago by the great Socialist thinker, Charles Fourier. With the abolition of aircraft, how will people get from America to Europe, Asia, Africa, Australia, or Hawaii? Cortez proposes “running train” across the ocean. But as Fourier explains, anti-whales shall tow our ships across lemonade oceans. It is when we approach Harmony that things will begin to hum. A Northern Crown (after the manner of Saturn's rings) will encircle the Pole, shedding a beneficent aromatic dew on the earth. The sea will cease to be briny, and, greatest of delights, will be transformed into lemonade, for which unsatisfying beverage Fourier seems to have had a marked partiality. Six moons of a new and superior quality will replace our present inefficient satellite. A new race of animals will emerge. In place of the lion, there will be the anti-lion, all that a lion is not, docile and serviceable; there will be anti-wolves and anti-bears, and a whole race of really nice beasts. If things are only taken in hand at once, telescoping various stages, the anti-bug may be looked for in 1829, along with the anti-rat. This is indeed good news for ‘Ie beau Paris, si richement meuble de punaises,' of which incidentally there are 42 varieties. Our merchant ships, knitting land to land, will be drawn by anti-whales. After these marvels, it is perhaps rather a disappointment to know that we shall then live only 144 years, of which, however, 120 will be spent in the active exercise of love. And of course, a new lighter-than-air anti-manatee (Yours Truly) shall appear and will carry good socialists on its back from continent to continent! How do we know this will happen? Grab your calculators, folks. This world has been granted a life of 80,000 years; there are 40,000 of ascending vibrations and 40,000 of descending vibrations. The arithmetic may seem weak, since there is also a period of 8,000 years of complete happiness- the Apogee du Bonheur. Doubtless this minor discrepancy is covered by Fourier's; general reservation that everything he says is subject to an exception of an eighth or a ninth. In all there are 32 periods, 16 in the upward and 16 in the downward ladder. We are at present in the fifth of the first eight stages, having passed through what Fourier calls the Sectes Confuses, Sauvagerie, Patriarchat and Barbarie. Ahead of us lies Garantisme, a stage in which human rights will be effectively guaranteed to us; at times, however, it is rather suggested that we may by-pass Garantisme. These eight stages take up 5,000 years, and we shall then find ourselves in Harmony-indeed more and more delirious grades of Harmony, for 35,000 years. Thereafter for 8,000 years we shall have that lofty table-land of perfect bliss, after which the world will go downhill again through precisely the same stages in the inverse order; and at the end, if any of us are left, we shall be transported to another planet. For anyone wanting to see more of our glorious future, check out this link (source for above text on the thought of Charles Fourier). That is one of my all-time favorite memes...I love a good pun. I just tried to liberate it in the name of the People's Justice (that is, you have something I want), but was unable to do so. To what party apparatchic need I apply to acquire a state-approved copy? Preferably suitable for framing. Is that a manatee named Hugh? I knew him, Horatio: a fellow of infinite jest. Social Democrats to Replace Air Travel with Teleportation! Alexandria Ocasio-Cortez is the new Democrat congresswoman from New York who is proud of her IQ somewhere above 60 collectively with her Democrat mates. This incredible genetically-linked advantage makes her the most influential and intelligent Democrat. Ocasio-Cortez unveiled her new GREEN initiative to reverse global warming and save humanity - but only for Democrats who are intersectional and can come up with a legitimate voter ID card that proves it. All the other non-intersectionals will have their ID cards destroyed to prevent unintentional thinking or people seeing their offensively light skin tone. She will rebuild America's infrastructure with OPM - Other People's Money. If that won't fly, said Ocasio-Cortez, she will consult with Barack Obama for advanced instructions about wishing and hoping, to be followed with Reality Denial 101. She will eliminate auto and truck transport entirely and replace it with a fast rail bridge from San Francisco to Hawaii, one between Beijing and San Francisco, others from New York to Paris and from Miami to Buenos Aires. One fast rail will transport all intersectionals between the north and south pole to warm those areas just in case the planet cooled too much. She also promises to reverse the laws of physics by proving that men of fighting age can walk through foot thick concrete walls at our southern border, and, accordingly, that walls don't work except everywhere where walls were erected. Ocasio-Cortez then brought out an even more ambitious plan that took her fourteen seconds to dream up, and referred to her father's dreams and her shaman in Puerto Rico. After consultation with her team of Democrats and their collective intelligence over 60, best demonstrated while wearing white pants suits, the modest Ocasio-Cortez admitted that she has invented a replacement for air travel: Teleportation. She told the gathering reporters, with the House Democrats behind her wearing serious faces, that the details on the new technology that she has tested will be forthcoming sometime this century, or the next, or the next after that, or when Donald Trump leaves office - whichever comes last. the new technology that she has tested will be forthcoming sometime this century, or the next, or the next after that, or when Donald Trump leaves office - whichever comes last. AND YOU WILL EAT IT IN THE RAIN. Such a glorious idea! Our children will be the most enlightened on Mother Earth! Correction: there shall be no ham. 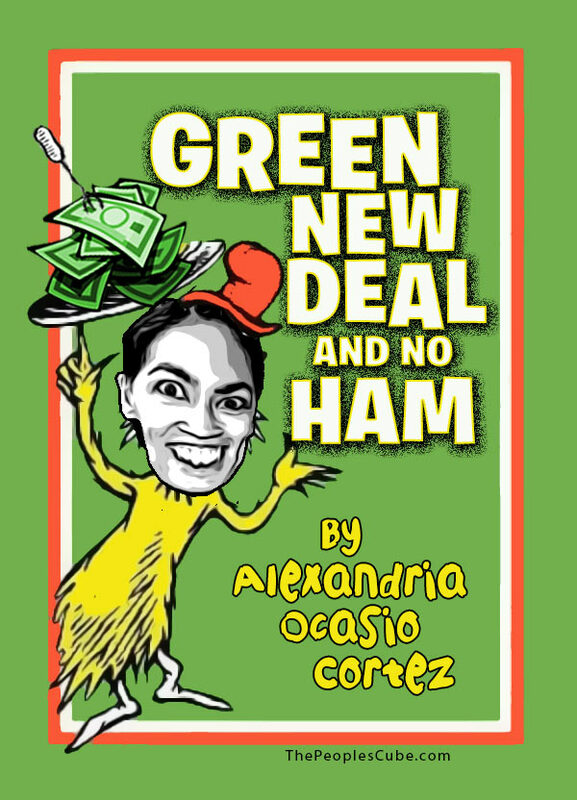 A.O-Cortez has an easy solution to the potential food crisis. Instead of the farting cows and pigs, the state will feed the unwashed masses with spit-roasted unicorns. Money for nothin' green energy. She'll never get blisters on her thumbs. We gotta ground those 747's we gotta move by high speed trains. That little bar maid hates the millionaires. And she up there, what's that? ...The arithmetic may seem weak, since there is also a period of 8,000 years of complete happiness- the Apogee du Bonheur...For Apogee do Bonheurs lasting more than 4 hours please seek immediate medical attention. A new race of animals will emerge. In place of the lion, there will be the anti-lion, all that a lion is not, docile and serviceable; there will be anti-wolves and anti-bears, and a whole race of really nice beasts. In place of the cat, there will be the anti-cat, all that a cat is not, cleaning up messes, guarding food storages, and enforcing law and order. And in place of the squirrel, there will be the anti-squirrel, working in hypnotherapy and helping humans to increase their attention span. "You are getting very sleepy....."
You filthy speciesist! Cats most CERTAINLY clean up messes, guard food, and enforce law and order. They're just from a different culture and don't have the same view of law, food, and mess that we do. And the Current Truth dictates that ALL cultures are to be respected and loved, except for Kapitalist or Khristian Kultures. Comrade Comissar Red, I expected more from a man of your calibre and pedigree! You are treading the waters of Nazism, Islamophobia, Racism, and Species Imperialism! Comrade Stierlitz - I stand korrekted. Presenting the Anti-Dog. Obama's Green Economy Creating MILLIONS of Green Jobs!